Pinchot Butte Roadless area is a distinctive 9,000 acre swath of country located 36 miles southeast of St. Maries, Idaho and separated from the expansive Grandmother Mountain Roadless Area by only one forest road. The area lies along the south side of the divide between the North Fork of the Clearwater River (to which all streams here drain) and the St. Joe River. 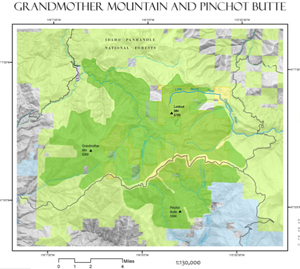 Pinchot Butte is the highest point at nearly 6,000 feet; the elevation drops to 3,400 feet at Floodwood Creek at the southern boundary. Narrow ridges that drop abruptly into steep, tapered draws characterize the topography. Several craggy rock outcroppings nestle along the slopes of Pinchot Butte and the tops of ridges, evidence of the area’s complex geology and structure. Vegetation is largely comprised of old-growth mountain hemlock and alpine fir interspersed with brushfields that sprang up largely as a result of sweeping fires in the early part of the 20th century. Pinchot Marsh is a unique and irreplaceable high elevation wetland with important sedge/carex grass species and sphagnum moss. The moderate elevation slopes provide crucial summer range for elk, and other wildlife includes black bear, whitetail and mule deer, and a variety of common small and non-game creatures. Cutthroat trout are found in the West Fork of Floodwood Creek, and essential Bull trout habitat overlaps this region. Pinchot Butte is relatively remote from centers of human population, thus developments in the area are few and opportunities for solitude are enhanced by the light visitor use and effective forest screen. Two low-standard roads are excluded from the roadless area, though one is already closed to traffic. Grandmother Mountain and Pinchot Butte. Click the image to enlarge.